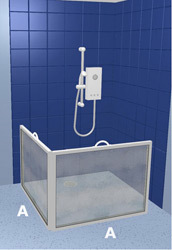 A Contour Carer shower screen is an easily portable alternative to a fixed shower enclosure. Compact and lightweight, Contour Carer shower screens offer splash protection and help to keep the carer dry during assisted bathing, whilst the folding design allows for easy storage when not in use. 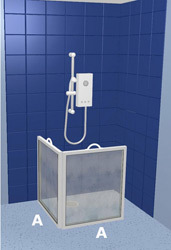 Fitted with robust handles to assist with positioning and for lifting, a Carer-shower screen is easy to handle and use when a temporary shower enclosure is required. 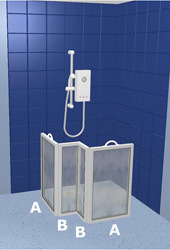 By removing the Carer-shower screen when it is not in use the shower area is then clear for other members of the household. 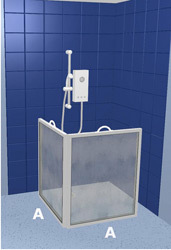 A convenient option to a fixed shower enclosure. Low screen height of 750mm, which is a preferred height for carers. Other screen heights available on request. Available in 4 sizes. Bespoke carer screen sizes available on request. We are able to adapt any existing configuration to meet your needs. Can be used on a shower tray or Wet room floor.